David Keenan On World Cafe : World Cafe During World Cafe's Sense Of Place trip to Dublin, we grab a seat by the water to hear the Irish singer-songwriter perform gorgeous songs on acoustic guitar. 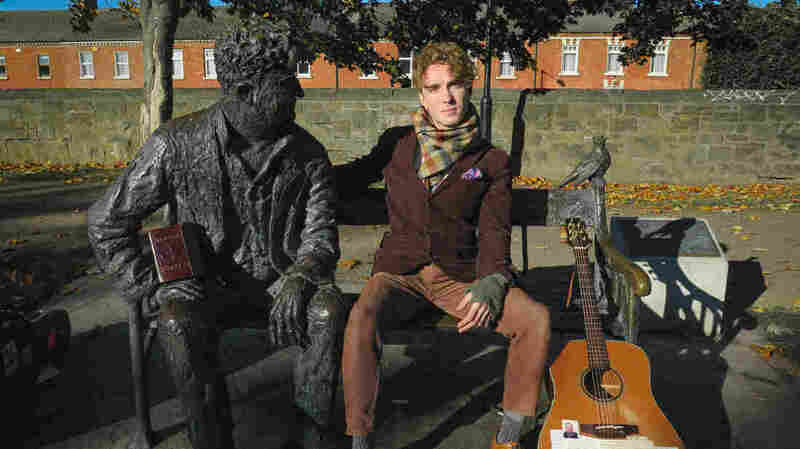 David Keenan sits with a statue of the beloved Irish writer and poet Brendan Behan along the Royal Canal in Dublin. "Keep The Peace, Prepare for War"
On our recent trip to Dublin, we asked Keenan to pick a meeting spot that felt important to him and were not at all surprised that he chose a spot commemorating beloved Irish writer and poet Brendan Behan. A life-like sculpture of Behan sits on a bench along the banks of the Royal Canal, inspired by a lyric in his famous piece "The Auld Triangle." When Keenan first moved to Dublin, he would often sit on this very bench beside Behan, confiding in him and drawing inspiration from his spirit. We grab a seat by the water to hear Keenan perform a gorgeous song on acoustic guitar from his latest EP, Evidence of Living, and he tells the story of spitting in his own hand to make a pact with himself before opening for Glen Hansard.